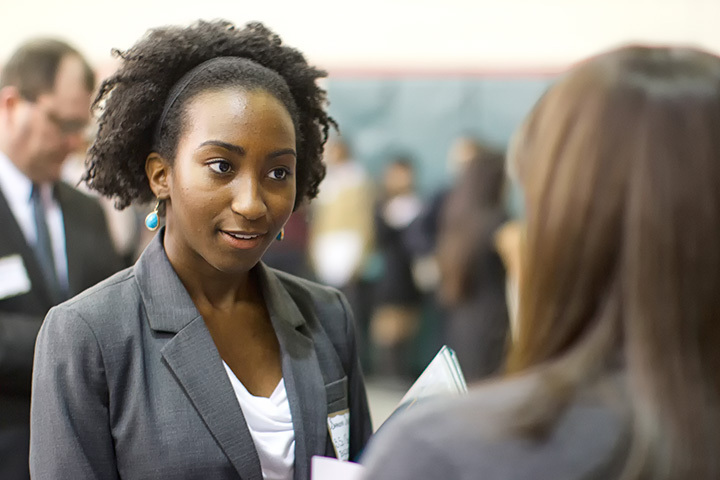 The event will allow employers an opportunity to meet and hire interns from a group of over 6,800 students pursuing undergraduate and graduate degrees. Please SAVE THE DATE on your calendar and register now for this event! The $200.00 fee covers lunch for three recruiters and table with a tablecloth. We will need to charge an additional lunch fee of $10.00 per person if there are more than three recruiters in your group. *The registration fee from this event provides funding for Erik Jonsson School Student Organizations. Student volunteers from the various organizations assist in the fair. To register, log in to the Handshake Job Portal to complete your registration. The event is held in the hallways of the Engineering and Computer Science complex. Each employer will be provided one draped table and folding chairs for up to three recruiters. If you have more than three recruiters, please let us know or register for an additional table. *We are sorry, but there is NO electrical hook-up available. *Wireless Internet access may not be available in the hallways. Directions to UTD campus: http://www.utdallas.edu/maps/. We will provide additional event information (e.g., parking, directions) after registration. Cancellation prior to January 25, 2019 will receive a refund minus a $50 cancellation fee. There will be NO REFUND for cancellation after the 25th. Registered organizations who do not show up will receive NO REFUND. Displays and materials may be shipped in advance. In order to receive your displays at the Intern Fair site, schedule shipments to arrival at UT Dallas Shipping and Receiving by January 25th. Packages must be clearly marked, " UT Dallas ECS Intern Fair 2/1/2019"
Shipping of your materials may be arranged for return at your organization's expense. Please pack extra air bills pre-addressed with your account information. Please attach your shipping air bill(s) to the displays/materials and leave them with the UT Dallas Industrial Practice Programs staff. For shipments that must go out immediately after the event, it is each company’s responsibility to schedule pick up with FedEx, UPS, etc. Otherwise, shipments will be scheduled to be picked up and shipped out within two business days after the event.